Our Wide White Whitewall Cleaner is an absolute must-have item for your wide whites. 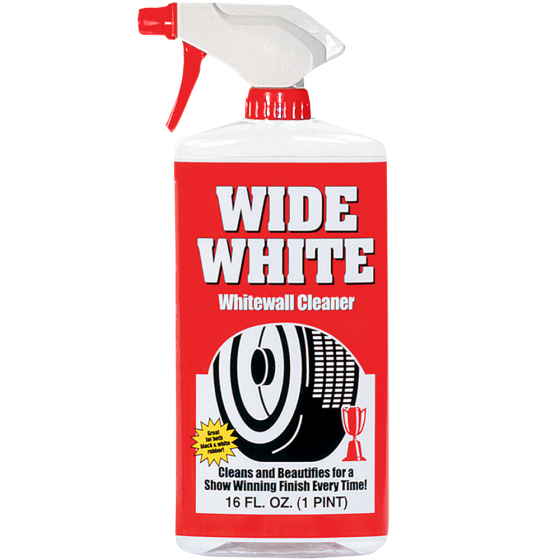 This safe Whitewall Cleaner makes it easy to get the bright white pop from your tires. The best recipe for great looking whitewalls is to keep them clean from day one. This White wall cleaner should be in every car guys detail kit. From the day you mount your whitewall tires, you should take good care to keep them clean for a long lasting and good looking whitewall. Keep your tires looking clean with this excellent cleaner exclusively from Coker Tire Company. Wide White has been developed specifically to aid in restoring and beautifying wide whitewall tires. This cleaner is safe to use on white rubber and is made from environmentally friendly ingredients. Restore your sidewalls to snowy white luster. 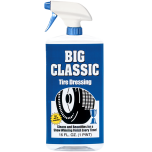 Use Wide White and Big Classic combination for your show car detailing, and save money by purchasing together as a combo! I assume that this will work on all width whitewalls? Also, will it help clean the gold stripe on American Classic tires as well? Yes, this will clean and brighten any width of whitewall, as well as gold lines, or red lines. Is this product also safe to use on painted rims in case of over spray? This product is safe for use with all wheel finishes and will not damage painted or powder coated surfaces. Are these products also OK for Vinyl Top Care & Cleaning? While not specifically recommended for such use, these products should not harm a vinyl top.